Powers/Abilities: Hermod possesses the conventional attributes of an Asgardian god including superhuman strength (Class 30), stamina, a long-life enchantment and a great resistance to all earthly diseases and injury. 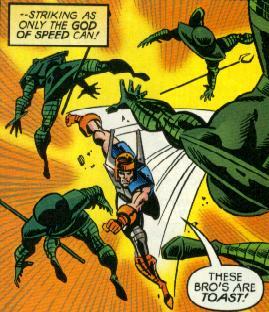 He also has the ability to move faster than any other god in Asgard at speeds to rival the Olympian god Hermes and the mutant Quicksilver. He can run at top speeds through dimensional apertures between worlds such as Earth and Asgard and Niffleheim without stopping or hesitating. In the form of Howie Barker, Hermod was an ordinary mortal, but was equipped with an enchanted headband which allowed him to travel at superhuman speed. He usually wore rollerblades while traveling at such speeds. History: (Norse Myth) - Hermod is the youngest son of Odin, King of the Asgardian gods, and Frigga, his wife. Noted for his speed and fleetness, he has been occasionally employed by Odin as a messenger. His older brother, Balder, had been poisoned by Hoder, using an arrow created by the trickster god, Loki. Knowing full well that Balder�s death was the first sign of the end of the gods, Odin sent Hermod to Niffleheim, the land of the dead, to plead for the return of Balder. Hela refused to be untouched by Balder�s death and refused to release him as Ragnarok claimed Asgard. (Thor I#294-295 (fb) - BTS) - Several Asgardians actually survived Ragnarok, among them Hermod�s brother Vidar. They found Odin�s spear Gungnir and were successful in restoring him to life as Odin successful returned to life all the other gods of Asgard, including Hermod as well. (Thor: Heaven & Earth#4 (fb) ) - <Ca. 9th century> Summoned by a dying Viking's plea Odin accompanied by Heimdall, Agnar, Balder, Hermod, Thor and Vidar came to Earth to fight Ddraig Goch, who had murdered numerous Vikings while they were searching for a maiden stolen from their lands by Prince Rhodri of Gwynedd. Though the gods defeated the dragon Odin forbade Thor from slaying the dragon because Ddraig Goch fought honorably and was only defending his land. Odin then bargained with Ddraig Goch, who agreed to persuade Rhodri to return the stolen Viking woman and to stop the blood sacrifices. (Thor I#474 (fb)) - Hermod and Hogun were captured by the Mogul of the Mystic Mountain and held within his dungeons, but Hermod was able to escape from him and warn Asgard that he had been restored to power, leading to his being overthrown. (Thor I#274-275, Thor Annual#7) - Odin sent Hermod to Niffleheim astride his steed Sleipnir to inquire from Hela the means to revive Balder who was slain by Loki. (Thor I#276) - After Balder was protected from being claimed by Hela, Hermod served as a witness while Loki stood trial for his crimes against the gods. The gods determined Loki's guilt, and he was imprisoned. (Thor I#300-301) - Hermod was among the Asgardians who donated their life-energies to the Destroyer against the Celestials. After those energies were lost, Thor collected life-energies from the sky-fathers of the other pantheons to revive Hermod and the other Asgardians. (Thor I#306/2) - Hermod was at the stables in Asgard when Nanna came and stole Sleipnir from him so that she could ride the scene of Balder's impending marriage to Karnilla. Hermod attempted to stop her, but was not as fast as Sleipnir. (Thor I#350, 351/Avengers I#249 - BTS) - Hermod joined the forces of Asgard in opposing Surtur and his Fire Demons on Earth. (Thor I#352)- During the battle, Beta Ray Bill sent Hermod to inform their forces not to destroy the gate bringing the Fire Demons to Earth so that Bill could deactivate it himself. (Thor I#359 - BTS) - Because Asgard's Rainbow Bridge was destroyed by Surtur during the conflict, Hermod and the other champions of Asgard were forced to remain on Earth for some time, until the combined powers of Thor and Beta Ray Bill returned them all to Asgard. (Marvel Superheroes III#9) - When the Thermal Man joined forces with the Storm Giants to attack Asgard, Hermod made a perilous journey to Earth to inform Eric Masterson, then-mortal identity of Thor, and Thor returned to Asgard to battle the menace. (Impossible Man Summer Vacation Spectacular 2/3 - BTS) - Hermod warned the warriors of Valhalla of a demon that had invaded Asgard. The demon, however, turned out to be the Poppupian known as the Impossible Man trying to explore the realm in search of his missing son. (Thor I#454) - Hermod accompanied Tilda, Tyr and Brunnhilde in an attempt to plead for the lives of the Warriors Three, whom Odin had sentenced to death, but Odin was being possessed by Loki, and ignored their request. Ultimately, Loki was driven out of Odin by Eric Masterson. (Journey into Mystery I#504) - Odin cast a spell to trick Yggdrasil into believing that Ragnarok had occurred by casting the Hermod and the Asgardian gods into mortal lives with false identities. Hermod became Howie Baker who lived in the protection of Frigga as Frieda Baker who he was led to believe was his aunt. In this guise, "Howie" enjoyed rollerblading, and was rather girl-crazy. After being attacked by the Men in Black, agents of the Egyptian death god Seth, Howie was rescued by Ericka Velez, the mortal incarnation of Sif. The two of them returned to Howie's home to find Freda gone, but discovered that she had left behind a trunk containing Asgardian weapons. (Journey Into Mystery I#505) - Howie chose from the trunk an enchanted headband which gave him superhuman speed, and convinced Ericka to join him in battling the Wrecking Crew, who had attacked a bank. Ericka tried to hold Howie back, afraid that he would be hurt, but when a bystander was nearly crushed by a car thrown by Bulldozer, he entered the fray to save her. With the aid of Spider-Man and Code: Blue, the Wrecking Crew were defeated. (Journey Into Mystery I#506) - Ericka and Howie met up with the other so-called "Lost Gods", who had been joined by the Rock Troll Ulik. They soon met up with Amora the Enchantress, and Howie's teenage hormones went into overdrive. The Lost Gods journeyed to the underground lab where the Wrecker had been beaten up by an unknown assailant, and found themselves attacked by Seth and his Men in Black. (Journey Into Mystery I#507) - In the course of their battle, Freddie Moyer was gravely injured by one of Seth's blasts, but Howie realized that they could save his life with the golden apples found in Freda's trunk. he had the Enchantress return them to Ericka's apartment, and by feeding Freddie one of the apples, they saved his life. Just then, Freda arrived at Ericka's apartment, and was reunited with Howie. She revealed to them that Pietro Vizarri and Wad (the earthly guises of the Grand Vizier and Odin) had been captured by Seth's forces. (Journey Into Mystery I#508) - As the Lost Gods prepared to head after Wad and Vizarri, Ericka ordered Howie to remain behind, not wanting him to wind up in any more harm. But when Amora cast her spell to teleport them to Seth's dimension, Howie speed through the portal after them, and consequently caused the spell to go awry, landing them in the midst of Seth's Demons of Death. As they fought them, Red Norvell appeared, having been restored to life by Seth to serve him. The Lost Gods retreated, but found that they had lost track of Howie during the fight. 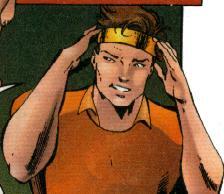 (Journey Into Mystery I#509) - Confused and frightened, Howie discarded his headband and attempted to come to grips with all that had happened to him since discovering he was a god. When the other Lost Gods were captured by Seth's forces, he took up the headband again, determined to save his friends. (Journey Into Mystery I#510) - Howie tracked down Seth's castle, and fought off the Demons of Death as he made his way to the dungeon, hoping to rescue the other Lost Gods. However, he was caught by Lorelei, who snared him in her scarf, which she magically wound about his body. Ericka managed to inspire the other Lost Gods into breaking free of their bonds, and Tyrone Hammer (the mortal guise of Hogun) set Howie free. (Journey Into Mystery I#511) - Howie joined the Lost Gods in battling through Seth's castle, and they managed to rescue Vizarri (who had become the Grand Vizier again) from Seth's clutches. The Vizier used his magic to return them and Wad to Earth. (Journey Into Mystery I#512) - Joined by the Frost Giants Mroht and Pyllar, the Lost Gods regrouped at Ericka's apartment and prepared for their final showdown with Seth. Howie took up firearms and fought Seth and his forces in Asgard as they invaded, but on Earth, Red Norvell undid Odin's spell, causing all of the Lost Gods to revert to their godly forms, including Howie who again became Hermod. Now that they were gods again, Seth had the opportunity to slay them all by destroying Yggdrasil. (Journey Into Mystery I#513) - Hermod continued to battle Seth's forces, but was impaired by his mortal personality and instincts, which got in the way of his godly attributes. However, Odin was able to overcome his mortal memories and defeat Seth, saving Asgard. Asgard was then assaulted by the Dark Gods, who took all of the Asgardians prisoners. (Thor II#12 - BTS) - With the defeat of the Dark Gods by Thor, Hermod and all the other gods of Asgard were set free and returned to Asgard. Comments: Adapted by Roy Thomas, John Buscema and Tom Palmer. Considering that Hermod�s myth is largely tied into the story of Ragnarok, it is worth mentioning that his aforementioned relatives may actually be true for the original Hermod. It is probable that the current Hermod might predate back to the original Asgard described in a story to Thor by the sentient eye of Odin. There is a bit of a curious addendum to the Impossible Man Summer Vacation Spectacular. The Impossible Man learned about the Gods of Asgard from a book in the New York Public Library before he entered Asgard and "recognized" Hogun, Fandral and Volstagg who are not actual mythological characters. Perhaps he recognized them by reputation or in the Marvel Universe, they do have some sort of mythological basis. Hermod supposedly died during the Ragnarok in Thor II#85.